Near the middle of Clear Lake, a thermal spring from a fissure on the lake bed creates a bubbling cauldron on the surface, evidence of continuing volcanic activity in the region. A hundred miles north of San Francisco, nestled in the heart of the coastal mountains and rarely visited, is California's largest freshwater lake and perhaps the oldest lake in North America. Covering around 68 square miles in area, Clear Lake stretches diagonally across the landscape from northwest to southeast, its three "arms" joined by a narrows. On the shoreline just south of the narrows, the lake's guardian, a once-active volcano known as Mount Konocti, looms several thousand feet above the surface, its eastern flank descending directly into the murky, green-brown water. may have spewed out molten lava as recently as 200,000 years ago. While Konocti now rests, its volcanic heat still lingers under the lake. Only eight miles above an active magma chamber, the waters of Clear Lake roil with volcanic angst. About 250 feet off Horseshoe Bay (There is a bubbler at 39º 01.482'N and 122º 46.360'W. 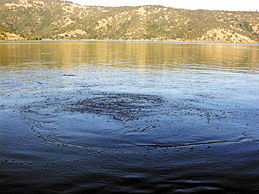 It is 1/2 nmile west of Shag Rock), near the middle of the lake, a bubbling surface cauldron a few yards in diameter churns and lifts the water with enough force to alter the course of boats and redirect the waves. About 35 feet below this perennial turbulence, a thermal spring jets from a great hole in the bottom of the lake. Of the many bubbling fissures that lend effervescence to Clear Lake, this particular vent is the mother of them all—a tectonic yawn broad enough to invite human passage. 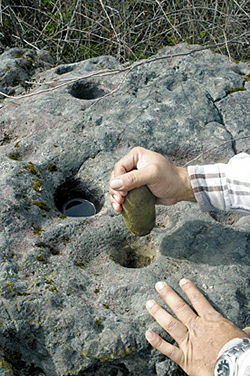 Grinding holes used by Native Americans who first came here over 10,000 years ago. The curious scientists who donned diving gear and made several tricky descents into the opening in the 1990s described a pulsing cycle in which a few minutes of vigorous bubbles alternated equally with modest bubbling. A strong water current helped push the divers upward toward the surface, while another along the walls of the opening pulled downward into a lakebed fault. At about 65 feet into the hole, the narrow tube broadened into a 20-foot chasm where water was emerging forcefully through a bottom of soft clay. No gas bubbled within the chamber itself, except on a single occasion when a diver reported being hit in the face with a gas bubble bigger than his head. The content of the gas emitted from the "mother" spring has yet to be analyzed, but countless other springs in and around the lake spew up bubbling water rich in various "healthy" minerals that provided Clear Lake with its former days of glory. During the late nineteenth century, entrepreneurs made fortunes here in bottled mineral water while swanky local resorts lured San Francisco's wealthy. Vacationers and health-seekers flocked by the thousands to Clear Lake area resorts during an era when mineral water was a recommended cure for a long list of ills, including cancer and syphilis. By 1894, Clear Lake's elegant Bartlett Springs Resort alone held accommodations for 5,000 guests. More than dozen other Lake County mineral springs resorts competed successfully with their European counterparts during this golden era, which lasted well through the turn of the century. But long before the rich vacationed at Clear Lake's spas, native people found the basin a life-sustaining place. At Borax Lake near the lower arm of Clear Lake, archeologists have discovered some of the earliest artifacts of Californian history. Clovis point spearheads suggest there has been human habitation around Clear Lake for at least 10,000 years. Among the more recent groups to inhabit the region are tribes known collectively as the Pomo. Their oral history allegedly describes a severe drought during which the lake water fell dramatically, exposing a tunnel at the base of Mount Konocti. Pomo explorers said to have entered this tunnel found a gigantic, elevated cavern and lake. They described "blind fish"— organisms without eyes—swimming in the mountain lake. As fantastic as this sounds, the account is scientifically plausible. Evidence suggests there is at least one interior cavity in Mount Konocti, accessed by tubes through which the mountain breathes with great force. This phenomenon has spooked many an unsuspecting mountain hiker. The unusual movement of plants or flying insects along the volcano's slopes suggests that a steady air current, like the breeze from an electric fan, forces air into or out of the mountain via small openings. Mount Konocti routinely "breathes" in response to ever changing weather fronts to equalize air pressure between the interior and exterior of the mountain. The air vents through tubes that may have once transported molten lava from a central chamber. These openings might also provide entrance to the mountain interior. From the early 1900s, residents began describing strange findings in caves near the top of Mount Konocti. According to these stories—documented in the mid-twentieth century by local historian Henry Mauldin—those who crawled into these caves found they extended into horizontal tunnels that ended abruptly at a vertical shaft. Items dropped into the shaft were never heard to hit bottom. In corroborating accounts reported as recently as the 1950s, painted cans and marked sticks dropped into the shaft were found floating in Clear Lake days or weeks later. Many presumed back then (and some still do) that the mountain's legendary interior lake discharged into Clear Lake, possibly at the same place where the Pomo had entered. But no river flowing from Mount Konocti has ever been found. Scientists who dove to the location of the supposed river discharge found only a flat and featureless lakebed, with no indentations or other evidence of water flow. The legendary shaft and cavern have not been found either, though not for lack of trying. A group of explorers has been burrowing into Mount Konocti for years hoping to locate the interior described in legends. If the stories are true and the shaft is found it would be the highest underground vertical drop on Earth: over 2,000 feet straight down. In 1990 the group located one of the caves it had been seeking. It appeared just as a local man who had known the spot in his youth had described it. The man's initials (among others') were found carved on the wall of the cave beside the date, 1934. The diggers made their way into the passage beyond the cave, shoveling through the dirt and rock debris that had settled in the passage; but they never found a shaft. Tunneling of that scale may not reveal the long-sought interior of Mount Konocti. Area geologist Dean Enderlin explains that because the mountain is subsiding, passages that might have been accessible 70 years ago could have easily become blocked since then. And a few tunnels, according to local rumor, may have been dynamited by landowners wishing to avoid accidents on their property. So although geologic conditions do favor the native story, confirming it will be frustrating at best. "It may be," Enderlin says, "that Mount Konocti will never reveal that secret." Another persistent puzzle is why a nineteenth century settler gave the lake its present name, a name that has triggered well over a century of disappointed visitors. Only dead lakes are clear, and Clear Lake's murkiness is a sign of its vitality. Core sample analyses show Clear Lake has been shallow and eutrophic—dominated by plant life—for almost 500,000 years. What clear waters were once found near the surface of Clear Lake have been sharply reduced as a result of developments around the shoreline. Agriculture, roads, and housing all contribute to sediment and nutrient loading from runoff. During the 1980s, summertime water visibility shrank to less than twelve inches, but water clarity has rebounded over the past decade to about three feet. No one is quite sure why, but any further improvement in relative water clarity may hinge on reducing nutrient loading in the lake—a problem made worse by wetlands loss. Of the historic 9,000 acres of water-filtering wetlands adjacent to Clear Lake, 7,000 have been eliminated by human activity. With most of is former filtering system gone, the lake gets unwanted nutrients from erosion, fertilized vineyards, and gardens. Beginning in the late 1920s, increasing nutrient loads fed an extreme overgrowth of blue-green algae, which zooplankton can't eat. These algae overbloomed, got trapped at the surface, and rotted, causing a fetid mess in spring and summer. The problem persisted for decades, but has greatly subsided since 1991. Lake managing agencies are hoping to keep algae populations in check by keeping the invading nutrients to a minimum. One plan for curbing nutrient loading in the lake is to reclaim the Rodman Slough wetlands on the upper arm of the lake, at the confluence of Scott's and Middle Creeks. The area is thought to be a significant source of the lake's extra nutrients, and the Rodman Slough restoration project should increase current lake wetlands by about 70 percent. The project will replant native tule reeds, which filter nutrients and provide habitats for waterfowl. Meanwhile, Clear Lake's birds are flourishing. Almost 9,000 western grebes live there, along with ospreys, wintering pelicans and nesting bald eagles. They are evidence that local bird life is recovering from an error that once made Clear Lake a poster child for environmental transgression. For years, beginning in 1949, DDD was sprayed on the lake to control gnats; as this biocide worked its way into the food web, it poisoned numerous organisms, notably the grebe, which dropped from 1,000 nesting pairs to almost none. Rachel Carson in 1962 publicized this incident in Silent Spring. As her book sparked an ecological revolution, it also stigmatized Clear Lake. While still recovering from these mistakes, the area was dealt yet another traumatizing blow. In 1990, the Sulfur Bank Mine on the northeastern shore was declared a Superfund site. The sparklingly clear spring water in the 90-foot-deep Herman Pit, situated above lake level, seeps through shoreline mine tailings before entering the lake. On the way, it may be picking up sulfuric acid and mercury and releasing them into the aquatic system. Remediation efforts completed over a decade ago restored the original shoreline and reduced the flow of rainwater through the tailings. They removed waste rock that had piled up in the lake, stabilized the mining debris with concrete, added soil, and revegetated the land. Lake sediments close to the mine contain mercury levels hundreds of times higher than sediment at the opposite end of the lake, 18 miles away. Yet while much reporting has spotlighted Clear Lake for the Superfund designation and the high mercury levels, media coverage has consistently overlooked scientific data indicating how Clear Lake's ecosystem effectively prevents much of the mercury from entering the food chain. In the relative murkiness of Clear Lake is a biological filtering system thought to control how much methyl-mercury actually enters the higher levels in the food chain. Methyl-mercury is found in most freshwater and saltwater fish, and can pose a health risk when big predator fish are consumed in sufficient quantities. Fish consumption warnings, issued in 40 states, include advisories for the San Francisco Bay and Delta, along with 13 other California water bodies, including Clear Lake. Yet, while Clear Lake has some of the highest levels of mercury loading in the nation, these levels are not reflected in its fish. "A lot of mercury is entering Clear Lake, but it looks like much of it isn't getting into the fish, "says Darrell Slotton, a UC Davis researcher. Slotton, who studies mercury bioaccumulation in water bodies all over California, says that the eutrophic character of Clear Lake may greatly mitigate the impact of mercury. In less murky waters, mercury gets into fish at much higher levels. Some clear, small lakes in Wisconsin contaminated by only a single gram of mercury have fish with higher methyl-mercury levels than fish from Clear Lake, a water body that contains tons of mercury. Mercury levels in fish from the Davis Creek Reservoir— southeast of Clear Lake near the Yolo County border—are three times higher than in fish from Clear Lake, even though mercury inputs at the reservoir are lower. "All that biomass and suspended sediment in Clear Lake," says Slotton, "acts like a magnet for mercury." Despite rumor, the lake water itself is safe both for swimming and even for drinking. Scientists at UC Davis have calculated that a person could drink untreated Clear Lake water for 80 years in order to consume the mercury contained in a single fish dinner. Reassuring the public that the water in Clear Lake is perfectly safe has been a different matter; the presence of a Superfund site has posed serious problems for the lake's economic health and its already tainted reputation. But at least there has been one positive outcome: funding for extensive ecosystem research. Clear Lake is now one of the best-studied geological basins in California. And while the Sulfur Bank mine was once an eyesore, remediation, nature, and time have done a good deal to improve its appearance (though recent data show that its mercury leaks have not been reduced in the process.) Developers are planning to drill test wells for geothermal resources near the Herman Pit; their proposed power plants have been excluded from an ordinance that otherwise bans development within a half-mile of the lakeshore. But the community is wary. More than 200 citizens attended a public meeting to protest the geothermal power plant proposed for the Superfund site. The strong grassroots effort to protect the lake—hundreds of watershed volunteers, a Sierra Club chapter with a large and active membership, and the combined Pomo and Wappoo tribal groups' coalition for environmental resources—suggest that Clear Lake's era of environmental naiveté is long past. Meanwhile, science still vies with mythology to explain the features of this peculiar landscape. If and when researchers can fully describe the elusive passages through its breathing mountain, the gassy hole in the bottom of its lake, and the ecosystem function that prevents the mercury from showing up in its fish, then perhaps mythologists can explain why Clear Lake somehow remains forgotten. The Clear Lake basin formed between two and three million years ago. For a lake to exist this long is extremely rare. Most lakes gradually fill with sediments and evolve into marshes and then meadows. Clear Lake, however, has remained unconquered because its lakebed is self-adjusting. Like many of the inland valleys in northern California, the lake sits in a fault-controlled basin. The faults along its northern edge comprise a so-called "trap door graben" that sags downwards under the immense weight of the sediment load. The result is that the lake floor drops at the same rate that sediment washes in, about two millimeters per year. As the old faults maintain Clear Lake's ability to impound water, younger faults protect it from geological complacency. The active Konocti Bay fault, a northern cousin to the San Andreas Fault, runs north-westerly into the middle of the lake. Only about 10,000 years old, it still produces earthquakes. The shoreline and drainage of Clear Lake have been all over the map, once draining into the Sacramento River, then later emptying west to the Russian River and into the Pacific Ocean. A landslide two to ten thousand years ago blocked the western outlet, raised the lake level, and forced a southern water exit via Cache Creek. Juliane Poirier Locke is a journalist and author. She lives at the foot of non-volcanic Mount St. Helena, California.